One of the tricks to learning photography is to look at a few hundred photos by great photographers, then go out a shoot a few thousand of your own. But photography is as much about ideas as it is the gear you’re packing. It’s great to get inspired by the work of someone you admire, but it’s tough to learn from them when you don’t have anything more than the kit lens. That’s where ShutterDial comes into play. This photography search engine helps you search for images by camera settings, including lens type and camera body. With it, you can filter images according to your available gear and study images that you can recreate right now. Flickr has more than 13 billion images stored away. You can use the Camera Finder tool to search through the bog. 500px also provides a similar feature. But ShutterDial bridges both with a friendly interface. Enter the kind of photograph with the focal length, aperture and shutter speed you want. Adjust the aperture and shutter speed through sliders. The contact sheet is generated within seconds. You can browse through the photos and click on them to go to the source page on either Flickr or 500px. Notice that you can tweak the camera settings from the contact sheet page also. 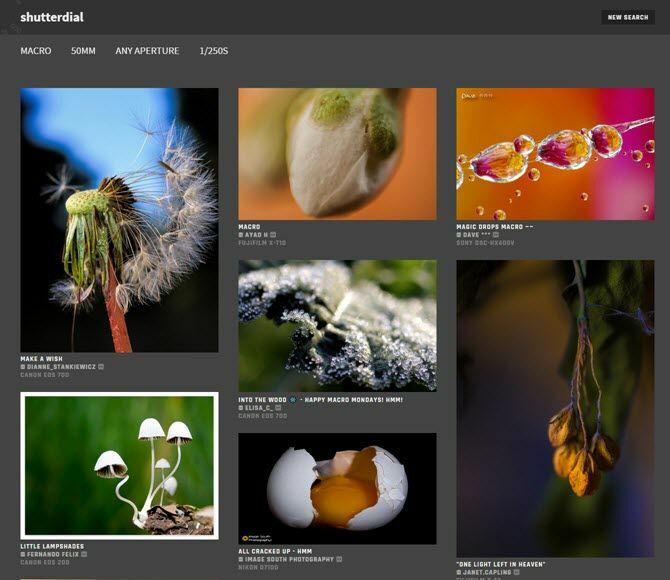 The site taps into the Flickr and 500px APIs and displays public photos based on camera settings. It follows the API rules and displays only the images that are explicitly allowed to be displayed on third party sites. The simple interface and the search fields on the homepage source the photographs within a few seconds. Even if you are an experienced photographer by now, I am sure you will wish you had this tool back in the day. Like me, every beginner photographer would love the polished work that has gone behind it.